Make lentils more flavorful with spices, a tangy dijon vinaigrette, and a few hearty vegetables. 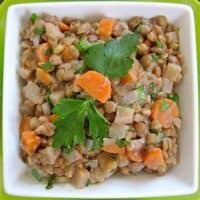 This Dijon Lentil Salad is great warm or cold! Peel and cut the carrots and turnip into a small dice (about 1/4 – 1/2 inch square). Cook the carrot and turnip over medium heat in a large pot with 2 Tbsp of olive oil until the turnip begins to turn slightly transparent (2-3 minutes). While the carrot and turnip are cooking, Cut the onion into a small dice. Add the onion, ground cloves and garlic to the pot. Continue cooking and stirring until the onions have become transparent (about 5 minutes). While the vegetables are cooking, measure out your lentils and pick through to make sure there are no stones or debris. Add the lentils and water to the pot. Place a lid on top and bring up to a boil. Let the pot boil until the lentils are soft which should take approximately 20 minutes. To check for doneness, take a few lentils out of the pot with a fork and taste. They should have a soft, bean like texture. When the lentils are done, drain them in a colander. Return the lentils to the pot (burner turned OFF) and add 1 Tbsp of butter. Stir in the butter to melt and let the lentils cool while you prepare the dressing. In a large bowl, whisk together the dijon, red wine vinegar, salt and freshly cracked pepper. Rinse and shake dry a half bunch of parsley. Roughly chop the parsley. Pour the still slightly warm lentils into the bowl with the dressing and toss to coat. Add the parsley and stir until everything is evenly mixed. Serve warm or refrigerate and serve cold!